For a downloadable quality manual examples please sign up for our e-zine on the right hand column. Your easy to edit ISO 9001:2015 Quality Assurance Manual. The quality manual is a reference for the policies and procedures. It should discuss the reasons behind your QA policies and procedures. The QA manual proves that your QA system elements have been thought out. It also assigns the responsible parties for execution of your QA plans. The quality control (or assurance) manual is a textbook for training. Train your quality control, quality assurance and inspection employees to the quality manual. You can use the manual to train other supervisors, leads, engineers and managers. In the case of employee turnover, quality manual examples provide continuity of operations. Without a valid and stable manual, personnel changes can cause serious process changes. The manual stabilizes your QA systems. The manual provides the QA code and prevents the unwanted practice of individual management decisions. The manual provides a top level documented that can be audited. By auditing the manual you understand which QA practices work and which ones need to be improved. ISO auditors will ask you for your Quality Manual. The auditor starts with this document. In many cases you will mail them the manual prior to their visit. They review the audit and then will ask you about specific info from the manual during the audit. For supplier control, ask your supplier for their quality manual. This will help you understand their QA systems. This can be very useful when you request supplier corrective action. If the supplier does not have a manual, this will force them to thinking through and documenting their procedures. What should you include in your QA Manual? Below is a list of recommended topics. 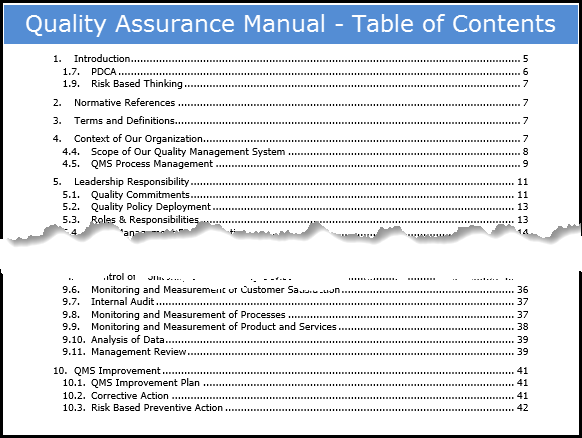 If you sign up for QA solutions e-zine, I provide an example of a Quality Manual that I have used in the past.